This People’s Guide To A Thriving Future, in both “Quick Guide” and “Complete Guide” versions, is provided to help you and your family and friends, community, country and world survive and thrive. It shows how to build a thriving future using Thrive! Strategy and Action Plans. The “Quick Guide” quickly takes you through the basics of building this future. The “Complete Guide” takes you through the basics of building this future but in addition provides detailed examples, the required worksheets, and the detailed Thrive! Next Generation Toolkit. Both are available via Amazon.com or as free download from this website [see below]. You might also want to use Thrive! - Building a Thriving Future - a manual providing greater depth on strategy and tools and which is available via Amazon.com or as free download from this website. Chapter 1: How to use this People’s Guide. Chapter 2: What a thriving future will be. Chapter 3: Why you and all of us must care about a thriving future. Chapter 4: How you and your family and friends can thrive. Chapter 5: How you and your community can thrive. Chapter 6: How you and your country can thrive. Chapter 7: How our world can thrive. Chapter 8. Thrive! System© (TS). Achieve thriving people and communities with highest levels of thriving for all everywhere. Chapter 9: How Thrive! Endeavor, you and all of us, builds thriving future. Appendix: Thrive! Next Generation Toolkit. Strategy, policy and tools. This People’s Guide To A Thriving Future [For All Forever] is provided in both “Quick Guide” and “Complete Guide” versions. It shows how to build a thriving future using Thrive! Strategy and Action Plans. The “Quick Guide” quickly takes you through the basics of building this future. The “Complete Guide” takes you through the basics of building this future but also provides detailed examples, the required worksheets, and the detailed Thrive! Next Generation Toolkit. How to use this Guide. (Chapter 1) This Guide helps you and your family and friends, community, country and world survive and thrive. For our selves, our future generations and our Earth on which we depend, you and all of us must, can and will achieve this future. This Guide describes what your life and world will be in this future where all survive and thrive forever, to the maximum extent possible. It lays out why you and all of us must care about this future. All of us want and need this future because of our endangered future and our human need to survive and desire to thrive. This Guide shows you how to build, achieve and sustain a this future for you and your friends and family, community, country and world. We can as we are now the most able in human history. To help, the Thrive! Next Generation Toolkit provides next generation strategy and tools. Finally, this guide shows how the Thrive! Endeavor, you and all of us together, builds, achieves and sustains a thriving future for all forever. What a thriving future will be. (Chapter 2) This Guide describes what your life and our world will be in this future where all survive and thrive forever, to the maximum extent possible. This future is Thrive! and is a bold vision and mission. It is different and better than anything tried or achieved in human history. It is a thriving future, not just getting by or achieving a surviving future. It is this future for all people and all future generations, a "50+ generation" strategy. Not just for some people or just for the current or next generation. It is this future forever, a 1000+ year strategy. Not just for today or just 100 years. It is also for Earth on which we live and depend, not just for people. Why you and all of us must care about a thriving future. (Chapter 3) This Guides lays out why you and all of us must care about this future for you, your friends and family, your community, your country and our world. You and all of us want and need this future because of our endangered future and our human need to survive and desire to thrive. What drives us is that a person and a people need to survive and desire to thrive in the current world and a sustainable future world. Further, because it is people who broke much of the world and endangered its future, it is people who must fix what is broken and build this future for all forever. How you and all of us can build a this future for you, all of us and those we care about. (Guide Chapters 4 through 7) Can we? Keep in mind that we are more capable than any time in human history. We can build this future by effectively and collaboratively using all available knowledge and tools, including Thrive! Next Generation strategy and tools. These strategy and tools are different and better than anything in human history. It is achieving that future at each level. It understands that people’s behavior, including yours, makes (or breaks) that future. It helps you and all of us achieve the behavior that in turn achieves this future at each level and for all forever. How can we do it for you and those you care about? Chapter 4 shows you how to build, achieve and sustain this future for you and your friends and family. Chapter 5 shows you how to build, achieve and sustain this future for you and your community. Chapter 6 shows you how to build, achieve and sustain this future for you and your country. Chapter 7 shows you how to build, achieve and sustain this future for our world. Each includes how to build a Thrive!Strategy and Action Plan. Chapter 8 shows you Thrive! Systems, how to use such a system to build, achieve and sustain a thriving future for you and your community. How the Thrive! Endeavor, you and all of us together, builds a thriving future. 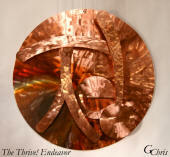 (Chapter 8) All of us together, including you, must and can build this future for all forever via the Thrive! Endeavor. It is only people that can and must fix what is broken and build this future. It will take all of us. For these reasons, Thrive! is and requires a vast, sustained people endeavor building and sustaining a surviving and thriving future for all forever. Creating and sustaining this vast endeavor and this future for all forever is the driving purpose of this People’s Guide.